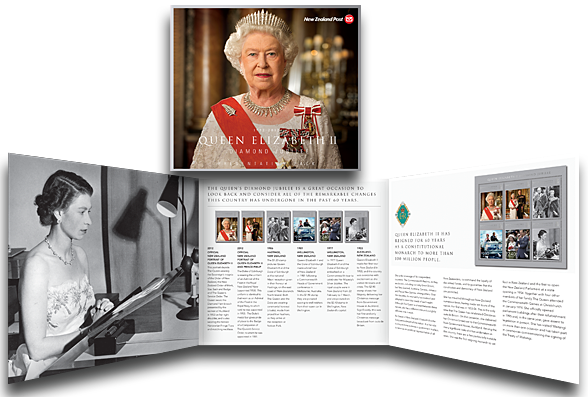 2012 marked a significant year for Her Majesty Queen Elizabeth II, as she celebrated 60 years as a dedicated monarch. 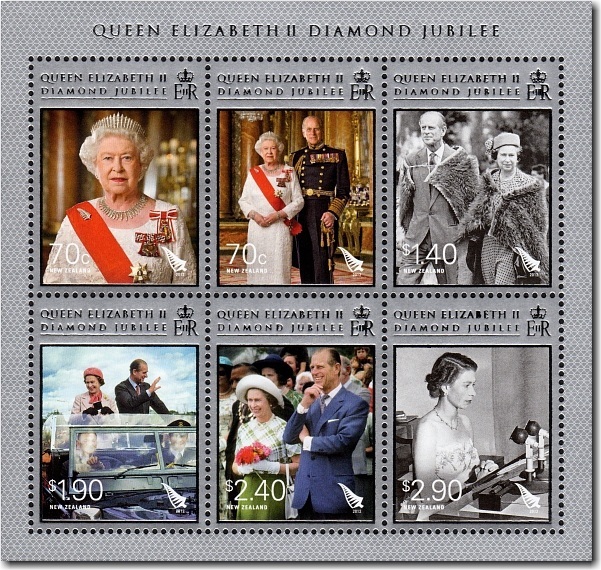 New Zealand Post was proud to present the Queen Elizabeth II Diamond Jubilee stamps to mark this prestigious anniversary. Official portraits (70c stamps) of Her Majesty Queen Elizabeth II and the Duke of Edinburgh wearing their New Zealand honours have been released to mark the Queen’s Diamond Jubilee. A used copy of the $2.40 stamp. The 60th anniversary of a monarch’s accession is known as a ‘Diamond Jubilee’, and it is certainly an occasion worth celebrating. 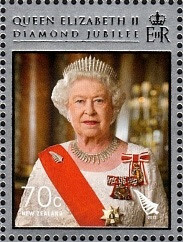 Queen Elizabeth II’s Diamond Jubilee is only the second in the past 1,000 years of New Zealand and British history. The first was Queen Victoria's in 1897. Queen Elizabeth II’s coincided with Waitangi Day on 6 February 2012. Queen Elizabeth II has close links to New Zealand and is the first monarch to adopt the title Queen of New Zealand. She has visited New Zealand on ten separate occasions, both officially and informally, and in the past six decades she had been actively involved in all aspects of New Zealand life. Featuring silver foiling on metallic silver ink, the Queen Elizabeth II Diamond Jubilee stamps reflected this prestigious anniversary. 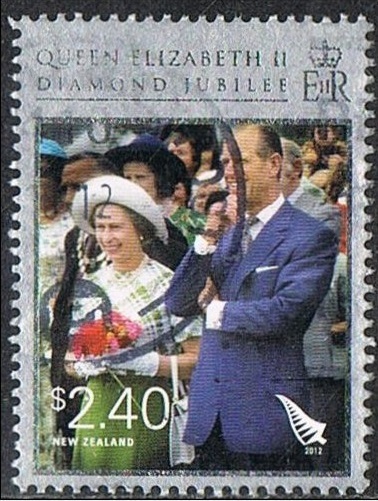 Each of the six stamps in this highly collectable stamp issue reflected Her Majesty's close association with a dedication to Aotearoa. 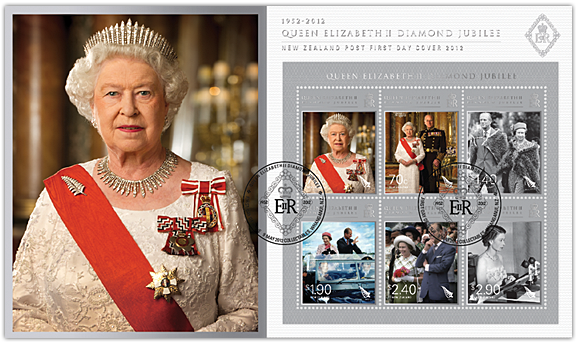 From the official 2012 portraits to photographs of the Queen's various tours of New Zealand, this was a stamp issue worth celebrating. This stamp issue wouldn't be complete without a miniature sheet and first-day covers. 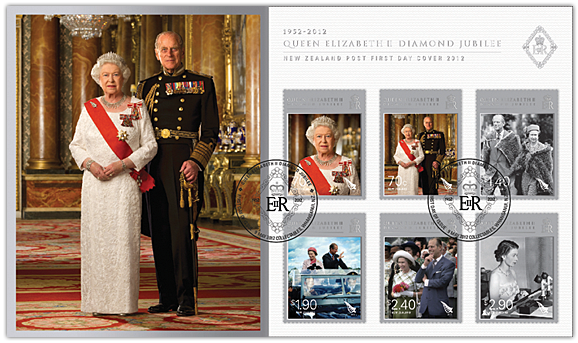 The first-day covers featured the official New Zealand portraits of Queen Elizabeth II and the Duke of Edinburgh, as well as the official New Zealand Diamond Jubilee emblem. They were the perfect accompaniments to the set of stamps. 70c - Official New Zealand Portrait of Queen Elizabeth II. Taken in the Blue Room of Buckingham Palace, this portrait depicts The Queen wearing the Sovereign’s insignia of the Order of New Zealand, the New Zealand Order of Merit, Star, Sash and Badge and The Queen’s Service Order. The Queen wears the Diamond Fern brooch presented by the women of Auckland in 1953 on her right shoulder and is also wearing the historic Hanoverian Fringe Tiara and matching necklace. 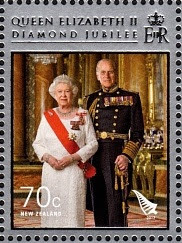 70c - Official New Zealand Portrait of Queen Elizabeth II and The Duke of Edinburgh. In this official portrait, the Duke of Edinburgh is wearing the uniform of an Admiral of the Fleet in the Royal New Zealand Navy (appointed 1958). This uniform is identical to that worn as an Admiral of the Fleet in the Royal Navy, to which rank he was appointed in 1953. The Duke’s medal bar gives pride of place to the Badge of a Companion of The Queen’s Service Order, to which he was appointed in 1981. $1.40 - 1986 Royal Tour / Maori Reception at Hastings. 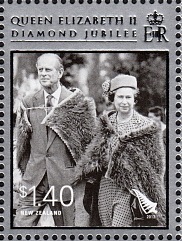 The $1.40 stamp pictures Queen Elizabeth II and the Duke of Edinburgh at the national Māori reception given in their honour at Hastings, on the east coast of New Zealand’s North Island. Both The Queen and the Duke are wearing ceremonial korowai (cloaks), made from prized kiwi feathers, as they arrive at the reception at Nelson Park. $1.90 - 1981 Royal Tour / Wellington. Queen Elizabeth II and the Duke of Edinburgh made a brief tour of New Zealand in 1981, following a Commonwealth Heads of Government conference in Melbourne, Australia. 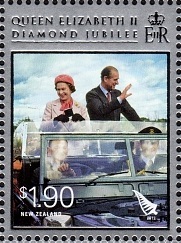 In the $1.90 stamp, they are pictured waving to well-wishers from their open car in Wellington. $2.40 - 1977 Silver Jubilee Tour / Wellington. In 1977, Queen Elizabeth II and the Duke of Edinburgh embarked on a Commonwealth tour to celebrate Her Majesty’s Silver Jubilee. 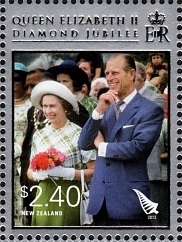 The royal couple were in New Zealand from 22 February to 7 March, and are pictured on the $2.40 stamp in Wellington, New Zealand’s capital. $2.90 - 1953 Royal Tour / Christmas Message from Government House, Auckland. Queen Elizabeth II made her first tour of New Zealand in 1953, and the country was overcome with excitement as she visited 46 towns and cities. 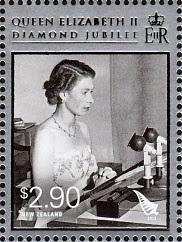 The $2.90 stamp shows Her Majesty delivering her Christmas message from Government House in Auckland. Significantly, this was her first and only Christmas message broadcast from outside Britain. Miniature Sheet - Showing all six stamps. First Day Cover - 9 May 2012. Miniature Sheet First Day Cover - 9 May 2012. These stamps remained on sale until 8 May 2013. Nice set of stamps. Being a bit older, I'm a bit of a royalist. I enjoy stamps featuring Queen Elizabeth.